The case has been quietly motoring along the usual grounds, but depositions released show the full extent of the back story of how Warren worked as a publisher, and how The Rook came into being. That's always a good thing for historians, but what really separates this case from most other copyright cases are accusations of forgery, witness tampering, theft and outright lying, both back in the day and now. Part of DuBay's case hangs on this document, a copyright assignment notice signed in 1986 by James Warren. This document gives Bill DuBay the rights to The Rook, free and clear. As the following deposition will show, there's one major problem with this piece of paper - Warren is adamant that he did not sign it, that he has no knowledge of it and he would never have authorised it. If Warren did not sign this agreement, then who did? And why was such a document drawn up two years after Warren Publishing had gone bankrupt and sold off their assets at auction? Is it true, as Warren says, that the letterhead used in this document was not used post 1980? There's a lot of questions that still remain unanswered so far. Make no mistake, this case is well worth reading. Naturally, to save everyone the time, I've gotten hold of the more interesting documents and I'll be posting them here over the coming weeks. Expect to see, and hear, a lot more about this case as it continues to unfold. In the meantime, may I present to you, Mr James Warren as you've never seen him before. Under oath. It's a lot to read, but it is well worth it. Examination by Attorney Cox: Good morning, Mr. Warren. My name is Vincent Cox and I represent Stephen King and the other Defendants in a case that's been brought by Benjamin DuBay. It relates to a work entitled The Rook, and I'm going to be asking you some questions about that. But in typical lawyer fashion, I'm going to have to go through some preliminary matters in order to --- before I get to those. Let me begin by asking if you understand that you're under oath. Do you understand that you're under oath today? Q: And are you familiar with a deposition proceeding and the nature of a deposition proceeding? Q: The court reporter to your right is going to be taking down everything that is said on the record today and is going to be preparing a transcript of today's proceedings. And you're going to have an opportunity to review that transcript and to make any changes that you consider to be necessary in order to make the transcript accurate. However, it's important that you give your best testimony today because either Mr. DuBay or any other attorney in the case could comment upon any changes that you make. So it's important that you do your best to give your most accurate testimony today? Q: Now, are you under medication today that has any effect upon your ability to recall or explain? Q: And where do you reside? What town --- what is the town in which you reside? Q: And what is your educational background? A: High school. Two years of college. Q: And did you enter the publishing business at some point? Q: When did you enter the publishing business? A: Approximately 1956 or '57. Q: And what company did you start? A: It was---- it was Warren Publishing Company. I don't remember the name that I originally started as. It was too long ago. Maybe it was Warren Publishing Company, but I don't remember. Did there come a time when you did form Warren Publishing Company? Q: And what publications were published by Warren Publishing Company? A: Many of them. First one was Famous Monsters of Filmland. Q: And after that, what other publications were published by Warren Publishing Company? A: Do you want me to list them all? There were many of them. Q: Well, list the principle ones, if you could. A: Well, there was Famous Monsters of Filmland. There was Creepy, Eerie, Vampirella, Monster World, Spacemen, The Rook, other one shots. Probably 20 or more of them. Q: And just for the record, what is a one shot, just so we have that in the record? A: I don't remember the titles, but we had the licenses to motion pictures, Star Wars type motion pictures. We had the license to Close Encounters of the Third Kind. Q: So a one shot that would be an example of a magazine that would appear with a particular title on only one occasion? A: Yes. It had a life of one issue. And I'd like to show you a document that --- a certificate of dissolution relating to Warren Publishing Company. We'll mark it as Number 1. Attorney Cox: Let me see if I can find another copy. Do you have a copy of that, Counsel? I mean, Mr. DuBay. 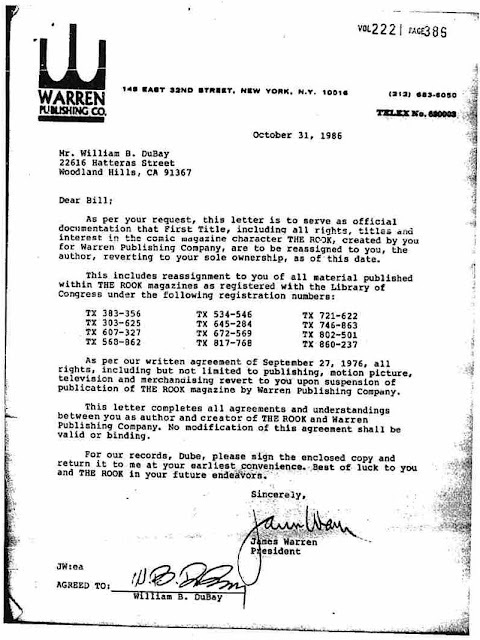 By Attorney Cox: That document from the Commonwealth of Pennsylvania appears to indicate that Warren --- that a Pennsylvania company called Warren Publishing Company was dissolved in 1974. Does that --- do you recall that? Q: Why was Warren Publishing Company dissolved in 1974? A: We moved to New York City and we established ourselves in New York City. Q: And at that time of the dissolution of Warren Publishing Company, what happened to the property that was owned by Warren Publishing Company? A: It was either signed over to me personally or to the new company. I don't remember which. Attorney Cox: Exhibit 2 is a document from the State of New York, Department of State, regarding a certificate of incorporation for a Warren Communications Corp.
Mr. Dubay: Do you have a copy of that for me? Attorney Cox: I do have that, yes. In fact, I also have a copy of Exhibit 1 for you. the distributive assets, if you'd like to have that clarified. assets. That's not going to be a dispute. Mr. Dubay: Okay. But you're saying this is a separate document. It appears to be a document that precedes this, one and the same, discussing the dissolution. This seems to be the certificate that ratifies this express dissolution admissions. Attorney Cox: No, this is a certificate of incorporation of Warren Communications. Mr. Dubay: No, what I'm saying is that Exhibit 1, you have you have marked as the certificate of dissolution, and the articles of dissolution which precede that do not appear to be included in the certificate of dissolution. Attorney Cox: This is a separate company. Exhibit 2 is a separate company. Mr. Dubay: No, I'm referring to Exhibit 1, Mr. Cox. Warren Publishing Company. Attorney Cox: That's fine. You can correct the record whatever way you wish. Mr. Dubay: Okay. I just wanted to see if you wanted the opportunity. By Attorney Cox: Does Exhibit 2 refresh your memory as to the fact that you incorporated Warren Communications Corp., in the state of New York? A: I'm sorry. I didn't hear that. Q: Mr. Warren, did you incorporate Warren Communications Corp., in the state of New York in 1972? Q: And what was your reason for incorporating Warren Communications Corp? A: Because I had offices in New York and I lived in New York. Q: And what functions did Warren Communications Corp., undertake after 1972, after you incorporated it? Q: And did it take over the publication of the titles that had previously been published by Warren Publishing Corp., the Pennsylvania company? Q: Now, later on, there was a company that was formed in 1998 called Warren Publishing Company. Do you remember that? It was formed in New York? A: No, I don't remember. Q: Let me show you Exhibit 3, which is a document from the state of New York, Department of Corporations. Do you recall that in 1998, you ---? A: I must have because this is the address I was living in at that time. But I didn't remember when you asked me the first time. Q: Okay. There is also a ---. Attorney Cox: So let's make Exhibits 2 and 3, let's give those to the court reporter to be marked. I'd like to mark as Exhibit 4 a document from the Department of State and the state of New York that includes a certificate of merger of Warren Communications Corp and Warren Publishing Co., into Warren Communications Corp., as of 1972. A: And what was the question? By Attorney Cox: I'm just handing it to you now. Do you recognize this certificate of merger? Does it bring any --- does it refresh your memory at all about the fact that Warren Communications Corp., and Warren Publishing Co., were merged into the New York Corporation Warren Communications Corp? A: I don't recognize the certificate, but I assume that that was done as part of our moving from Pennsylvania to New York. A: And I see it was signed by me and by someone who worked for me. Q: This case is brought by an individual named Benjamin DuBay. Before you learned of this lawsuit, had you known anything about Benjamin Dubay? Q: Mr. DuBay, the Plaintiff, is the nephew of an individual named William DuBay. Are you familiar with William DuBay? Q: And when did you first come in contact with William DuBay, to the best of your recollection? A: I don't remember the exact date. It was probably in the 1970s. But, again, I don't remember the exact date. Q: And in what context did you meet William DuBay? A: I don't remember what context I met him, but I knew of him as being active in the comics industry and I hired him as an editor for my company. Q: And your company published comics. Correct? Q: And in what capacity did you hire Mr. Dubay? A: As editor for, as I recall, Creepy, Eerie, and Vampirella. Q: And was he --- did you have an employment contract with him in writing? Q: Did you --- was he an employee of your company? Q: And did he receive a monthly paycheck? A: He did. I don't recall if it was weekly or monthly, but he received a paycheck. Q: And to whom did he report? Q: And what were his responsibilities? A: Editing the magazines that I named before, and production generally of other magazines, and supervision of the people who worked under him. Q: Did his employment responsibilities include sometimes writing or drawing material that appeared in the magazines? Q: And did there come a time where Mr. DuBay stopped being an employee? A: Again, I don't recall the exact date. Q: If you don't recall the exact date, that's fine. Was there a particular occasion that you recall upon which Mr. DuBay stopped being an employee at Warren Publishing? A: I don't remember a particular occasion, no. Q: And when I say that he was an employee of the company, what company was he employed by? Was it Warren Communications or Warren Publishing or both? Q: Do you recall that the bank account on which the check was drawn was in the name of Warren Communications Corp? Q: What individual employed by you was the --- the person who was in charge of issuing paychecks? Q: And was he the comptroller of the company? Q: And was Mr. Tunick aware of Warren Communications Corp., and its assets? Q: Do you know if Mr. Tunick is still alive? Attorney Cox: I'd like to mark as Exhibit 5 the title page from Eerie number 82, which is dated March of 1977. By Attorney Cox: Do you recognize Exhibit 5? Do you recognize this exhibit? Q: Was she somebody who was employed by your company? Q: And was she in a position that was senior to that of Mr. DuBay or did she report to Mr. DuBay? A: No. She reported to Mr. DuBay. Q: What was the function? A: Excuse me, I'm sorry. That's wrong. At that point, Bill DuBay had left the company and she replaced him as editor. Q: Well, Bill DuBay had left the company at that point? Q: Did you say Bill DuBay had left the company? A: I say that because I see he's listed here as consulting editor. And I would --- if he's listed as consulting editor, that means he's no longer editor. So he had probably left the company, and she replaced him, yes, because I remember she took over his job. I appointed her as head of our editor staff. Q: --- of your company? Q: And how was he compensated for his work? Q: Did you ever have any kind of written contract with Mr. DuBay regarding The Rook? Q: Now, there's a reference here to the cover being by Luis Bermejo and Bill DuBay? A: A reference to what? A: Oh, yes. I see. Q: --- was Luis Bermejo and Bill DuBay? Q: Was the --- who is Luis Bermejo? A: I think --- I think he was an artist, but I'm not sure. Q: Was he an employee of your company? A: No. He was not an employee. I believe he was freelance. Q: And who was it that paid for the creation of the contents edition number 82? Q: And so it was done at your --- was it done at your instance and expense? Q: Now, there's a copyright notice here that says it was copyrighted 1977 by Warren Publishing Co.
Do you see that there? It's in a block of text below the names? Mr. Dubay: It's the fourth line under second-class. A: Can you point that out? Mr. Dubay: I will. It says copyrighted 1977 by Warren Publishing Co.
A: Yes. Yes, I see it. By Attorney Cox: Now, as of 1977, the Pennsylvania corporation, Warren Publishing Co., had been dissolved? Q: But you had a company called Warren Communications Co.
Do you have any understanding as to why the copyright notice stated Warren Publishing Co., instead of Warren Communications Co.? A: I don't remember why we did this. No. But as of 1977, was --- what was Warren Publishing Co.? Was it a division of Warren Communications or was it ---? A: It was a division of Warren Communications Corp., as I recall. Attorney Cox: I'd like to show you a --- and mark as Exhibit 6 a title page from a 1979 publication called Warren Presents The Rook. Now, do you recall the fact that Warren published a publication called Warren Presents The Rook? Q: And how many of those were published by your company, to the best of your knowledge? A: I don't remember exactly. I think there were about four issues, but I'm not sure exactly how many. Q: Now, there's an indication here that the editor of this issue was W.B. DuBay. Was that a reference to William DuBay? Q: And the fact that he's listed as an editor, does that tell you that as of the time of that publication, he was an employee of your company? A: It appears that way, yes. Q: So was that a way in which you would distinguish between someone who was an employee of your company and someone who was not an employee? Q: And you would make that distinction by saying that an editor was an employee, but a consulting editor was not? A: If he's listed as editor, I believe that he was an employee. Q: And do you have any recollection of how it came about that he went between being not an employee and an employee in that time frame of 1977 to 1979? A: No, I don't. I don't have any recollection of why that happened. Q: I'd like to show you a document. We'll call it Exhibit 7. It is an enlargement of a portion of Exhibit 6, which I thought ---. The reason I enlarged it was that it makes the print bigger for the copyright notice, which can be sometimes difficult to read. This copyright notice states that the entire contents copyrighted by Warren Publishing Co., all rights reserved. And then it later states in the next paragraph, Warren Presents is published quarterly at the subscription price of $8 per year, by Warren Publishing Co., a division of Warren Communication Corporation. Do you know if you had any role in determining how Warren Publishing Co., was described in the copyright section of this --- of this document? Q: Who was it who had the responsibility for preparing the text of the copyright notices that would appear in each issue? Q: And was Daniel Tunick the person who was in charge of registering the works for copyright? A: Yes, he did that with every issue. He sent the copyright notice to Washington with our fee with every issue we published of every magazine we published. Q: Now, were you involved in the creative discussions that took place pertaining to The Rook? A: I must have been because I was involved with most of the projects that we published. Q: Do you recall anything about those creative discussions? A: Nothing in particular stands out. Q: In some of the documents that I've seen, there's a reference to an individual named Howard Peretz. Do you recall Mr. Howard Peretz having any involvement at all in connection with The Rook? A: None whatsoever. That name is not familiar to me at all. that was an interest of yours at that time? Q: Do you recall that you requested bill DuBay to create a character who would have certain attributes that became The Rook? A: I don't remember doing that. Attorney Cox: The next exhibit is going to be a copyright application. It's going to be marked Exhibit 8. By Attorney Cox: Showing you Exhibit 8. Exhibit 8 is a copyright application that is signed by --- it appears that it's signed by Daniel Tunick on the second page? Q: Do you recognize his signature? Q: And it is --- the copyright claimant is listed as Warren Publishing Company. Was --- at that time, the Pennsylvania corporation Warren Publishing Company had been dissolved. Who was making this copyright --- who was Warren Publishing Company as set forth in this Exhibit 8? A: I was Warren Publishing Company. A: Yes, I personally and individually. I had no partners, no stockholders. Q: So this registration was made on behalf of you as an individual? Q: And, again, why was it that the copyright claimant was listed as Warren Publishing Company rather than James Warren? A: We did not copyright our magazines in my name, James Warren. We copyrighted them in the name of the company, as I recall. Q: And did you form a sole proprietorship called Warren Publishing Company? Q: It was an informal --- it was an informal sole proprietorship? A: It was a corporation, Warren Publishing Company. Excuse me. It was a --- the name, Warren Publishing Company, was originally, as I say, from Pennsylvania. But I don't recall any proprietorship that I did, no. Q: Okay. So after the Pennsylvania corporation was dissolved, was --- did you become Warren Publication --- Publishing Company personally? A: I don't --- I don't understand the legality of that. There was only one person involved with Warren Publishing and Warren Communications, and it was me. Q: All right. So did you distinguish between --- was there a reason why it wasn't Warren Communications Company as the claimant? A: I don't remember the reason why. Q: But it was your intention that Warren Communications Company should not be the claimant? Mr. Dubay: That's leading. I object. A: I don't remember why we did this at the time I think it was just a matter of queen yens continuity. Mr. Dubay: I object to the question, leading. A: I don't remember why we did this at the time. I think it was just a matter of convenience and continuity. Mr. Dubay: I object to the question. By Attorney Cox: I have to re-ask the question just so we have a record. What was the reason why Warren Publishing Company was used as the copyright claimant rather than Warren Communications Corp.? A: I don't remember the reason why. It was discussed during our board meetings, but I don't remember why. Q: And who was on the board? A: I had four people, four or five people on my board. I had the president of our printing company. I had my attorney, my accountant, and one other person, who I forgot. Q: Was it Richard Conway? A: He was not on the board. Q: And to the best of your recollection, what was the substance of --- and was this a board meeting of Warren communications Corp.? A: Well, we held our board meeting --- we held our board meetings during the year. Yes, three or four of them. Q: And what was the substance of the discussion at the board of Warren Communications Corp., on this issue of who would be the copyright claimant on the publications? Q: But you do recall it was discussed? A: I do remember we discussed it, but I don't remember why we decided to do it this way. Attorney Cox: Do you have a copy of this document? Mr. Dubay: I have a certified copy of the document directly from the copyright office, if you'd like to see it. Attorney Cox: Yeah. Let's take a short break. By Attorney Cox: Q: Mr. Warren, we're back on the record now. And I wanted --- that causes me to want to mention to you that any time that you feel tired or uncomfortable or hungry or anything like that, you can ask for a break. This is not an endurance contest. And so at any time that you feel you need a break or want a break, you can just ask for one and you're entitled to one. Q: And the other --- the next thing I wanted to mention, that while we were off the record, Ben DuBay handed to me an original document that he obtained from the copyright office. It's a certificate of recordation for a document dated October 31, 1986. And I wanted to hand that document to you and ask you to look at the third page of --- and it's been marked as Exhibit 9. Please take a look at the third page of Exhibit 9. A: Yes, I see it. Q: Now, it's a document dated October 31, 1986, and it's on Warren Publishing Co., letterhead. As of 1986, was Warren Publishing Co., in existence? Q: When did Warren Publishing Company cease to be in existence? Q: And what was it that brought about the end of Warren Publishing Company in 1982? Q: And so this document in 1986, yours --- there's an indication here at the bottom of James Warren signing this document. Is --- is that your signature at the bottom of that page? Q: And why do you --- why do you say that? A: Well, because I know what my signature looks like, and this is an obvious forgery. A: Yes. When I dictated a letter, I dictated it to my secretary, Elizabeth Alamar. And this is how it appears, EA, Elizabeth Alamar. Q: Well, when was the last time that you saw Elizabeth Alamar? A: I hadn't seen or spoken to her since 1982. Q: So is there any way Elizabeth Alamar could have typed this document in 1986? A: No possible way because the stationery didn't even exist then. Q: Well, someone --- someone who was leaving Warren Publishing Company could have taken some blank stationery? A: Yes, I'm sure they did. This is one of our stationery that we used for many years, which we stopped using in 1982 because the company didn't exist at that time in 1982 at that office at that address. Q: When did you first learn that there was this October 31, 1986 document? Did you learn of it first this year or did you learn of it earlier than that? A: This document crossed my desk years ago. It surfaced during some legal proceeding that we had. And as soon as I saw it, I realized it was a forgery. Q: Do you know who caused this document to be recorded in the copyright office? A: I do not. Certainly not me. Attorney Cox: Let's have that document handed to the court reporter. I'd like to have marked as Exhibit 10 a document that I received by e-mail, I believe, yesterday. It might have been late the day before, but on or about yesterday. I'm showing you Exhibit 10. This is a document that I received in response to a subpoena to a woman named Vanessa Hart. I ask you to look at the second page of that exhibit? Mr. Dubay: I have to make an objection because this is not the document that you received. This document has been altered from the document that you received. The document that you received showed --- clearly showed a cut-and-paste mark around the date, October 29, 1982, as you're aware. This has clearly been altered since. Attorney Cox: Well, no. Actually, it's the copying process. Mr. Dubay: Oh, is that correct? cut and paste of October 29, 1982, over another document. And so I --- I was going to get to that. Mr. Dubay: Okay. I apologize. Attorney Cox: Sure. But you agree with me that there was a cut and paste for the date? Mr. Dubay: I agree that it's apparent. By Attorney Cox: Q: So looking at that document, do you have any --- that appears to be a photocopy of Exhibit 9 with a new date attached to it. Q: And is that your signature at the bottom of that page? A: Absolutely not. I never wrote this letter. I would have never written this letter, nor did I sign this. This is an obvious forgery. Again, it looks like it was forged by the same person. Q: And you state you would have never written such a letter? A: Well, because I did not assign or give the property to anyone in my company, let alone Bill DuBay. Q: Did you have any conversations with Bill DuBay in or about 1986? Were you in touch with him? A: Absolutely not. Excuse me. I might have been in touch with him. In 1986, you say? A: Yes, I was in touch with him about that time over the phone when I called him and I asked him for some documents that he had in his file that I needed. And he sent them to me. And we did this over the phone. I didn't --- he was in California at the time. I was here on the east coast. We spoke on the phone, he sent them to me, and I thanked him. And that was my contact with him. But we never discussed The Rook or anything else, and I never, never dictated this letter or even thought of dictating a letter like this. There is no question this is a forgery. Mr. Dubay: Is this Exhibit 9? Attorney Cox: This is Exhibit 10. By Attorney Cox: Did Mr. DuBay ever approach you and ask you to give him the rights to The Rook? Corp., in 1982? What was the precipitating factor, if you recall? A: I was not there to lead the company. I was not there to run the company. Q: And what was going on with you at that time? Q: What was it that caused you not to be there to lead the company? Q: What sickness did you have at the time? Q: And during what years did --- were you afflicted with this depression? Q: What years? Year or years? A: 1981, '82, around that time. Q: And for how long did that condition persist? Q: Was there any event that you recall that kind of helped to cure you or snapped you out of it? Was there anything that happened? A: Nothing snapped me out of it. Time cured me, but it took a long time. Q: And about when did you become cured? A: Don't recall the exact date. It's a gradual thing. Q: By the late 1990s, you had become cured? By Attorney Cox: Well, what is your best estimate as to the time frame within which you became cured? Q: Now, did William DuBay participate in the bankruptcy proceedings? Q: Did William DuBay participate in the bankruptcy proceedings? A: I believe he did. I believe he appeared in front of the judge, but I don't know the details of that. Q: Did you learn about it through your attorney? A: Did I learn about? Q: How did you learn about him appearing before the bankruptcy judge? A: I guess it was my attorney who told me about it. Q: So far as you're aware, did any legal --- was there any effect that resulted from William DuBay participating in the bankruptcy proceeding? just for the record, Ben, is this a document that you received from Vanessa or is this a document that you had in your files? Mr. Dubay: I believe we received it at the same time. At least that's what I requested of her. So she sent two separate e-mails, I believe one to you and one to me. And I forwarded it to you and you responded, I believe, that you had received it. Attorney Cox: Okay. I think that I might have misspoken because I don't think she sent me this document, but you then forwarded it to me. Attorney Cox: It just --- anyway, we have it before us. Mr. Dubay: The intention to was to provide it to you according to a subpoena that you requested. Attorney Cox: That's great. I appreciate that. By Attorney Cox: I'm showing you Exhibit 11. It is a document dated September 27, 1976. Do you recognize Exhibit 11 as a document that was dictated by you? And take the time to read it please. A: I never wrote this letter. By Attorney Cox: And what is it that causes you to say that? A: I never heard of Howard Perez or Package Play Development. And I never gave this participation to Bill, and I never heard of this company. And I never --- I'm seeing this for the first time. Q: Is that your signature on the second page? A: No, of course not. Same kind of forgery. Q: Did you have any kind of discussion with Bill DuBay about him participating in future benefits from The Rook? subsidiary rights, money coming in, that he would get a piece of it. Q: Was it your state of mind in this time frame in which The Rook was created that --- let me --- let me ask it in a way that won't draw a leading objection. Who is it that you understood was the owner of The Rook and all rights in 1977? A: My company was the owner. Exclusively. Q: And did you ever sign any document that conveyed any rights in The Rook to William DuBay? Q: There has been some evidence that's come to light that in or about 1994, William DuBay entered into an agreement with Harris Publications by which he made certain licenses regarding The Rook to Harris Publications. Do you have any knowledge of any such licenses? Q: Were you aware that Harris Publications published The Rook at any time? A: I was not aware. A: No, I was not in touch with him. The last contact I had with him was a telephone message on my phone saying that he was on his way to Europe for a vacation of some sort, and that he called to say hello. And that was the extent of the message. And I did not speak with him personally and I did not follow up on the phone call. That's the last contact I had with him. Mr. Dubay: Are you going to enter that as an exhibit? Attorney Cox: It's hearsay to this witness. This witness hasn't seen it. I don't feel I need to do that. Attorney Cox: Let's take a brief break. I may be done with the witness. Attorney Cox: This concludes my Direct Examination of the witness, Mr. DuBay. Mr. Dubay: Is it okay if I mark it on here or would you like the stickers? I'm going to mark this as Exhibit 12. Examination By Mr. Dubay: Mr. Warren, I'm going to mark this as Exhibit 12. If you flip to page two, this appears to be the articles of dissolution of the corporation Warren Publishing Company. Is it true that the legal entity known as Warren Publishing Company was dissolved on ---? Attorney Cox: Excuse me. Just before you start. Attorney Cox: Showing a witness a document that you've marked exposes you to an objection to its use at trial. Just I wanted to let you know that there's a problem with doing it in this fashion. Mr. Dubay: With the highlighting? Attorney Cox: With the highlighting, yeah. Mr. Dubay: Okay. We'll introduce it in another form, but I appreciate that. By Mr. Dubay: Do you recognize the signature as your signature of James Warren? A: Do I recognize it? Q: Do you recognize it, Mr. Warren? Q: Do you recognize the signature on this page? Is it true in item five of this document that all remaining property and assets ---? A: I don't have the document in front of me. Q: This is the document. Attorney Cox: It's page two of the document. By Mr. Dubay: Q: Same page. A: Is it true that item five ---? with their respective rights and interests? A: Well, if I signed it back in 1974, then it must have been true. So that is an affirmative answer of yes? Attorney Cox: The witness gets to answer. Not you. Were you the primary shareholder of Warren Publishing Company ---? Is it true that all assets, including copyright registrations, were assigned to you, James Warren? A: I'm not sure whether they were assigned to --- I think they were to me, yes. Of course. By Mr. Dubay: Okay. Exhibit 13 is a Warren companion cover. Do you recognize page two as a Warren companion cover? Can you tell me what the Warren companion book was about? A: About Warren Publishing Company. Is it true that it's definitive compendium to the great comics of Warren Publishing, as described on the cover? Mr. Dubay: Can you be more specific? Attorney Cox: Yes. I mean, there's no foundation that this witness knows all of the contents of the work and can state that it's the definitive. Certainly, the people who published this stated that it was definitive. By Mr. Dubay: Q: Is that's what's stated on the cover, the definitive compendium to the great comics of Warren Publishing Company? A: I don't know if you're going to hold me to this exactly. I don't know if it contains everything that we did. They have left out a few things. Q: But is that what it states on the cover? Mr. Dubay: If you could turn that over to the reporter, please. Exhibit Number 14 is the Warren companion title page. If you don't mind flipping to page two of the title page, Mr. Warren. Does it identify yourself, James Warren, as the consultant to this book? A: As a consultant, you say? Q: Yes, sir. Are you the consultant of this book, the Warren Companion? A: What is your definition of consultant? Q: Is it described on the title page? A: Yes, I know. Certainly I was interviewed and I answered questions and I contributed my knowledge to it, yes. If you call that consultancy, yes. But it is described on the title page, James Warren as consultant. A: Yes, that's what it says. A: Do I recover what? Q: Do you recall signing the Warren companion unlimited edition print? Q: Do you recall signing? Q: Signing the Warren companion, an unlimited edition print? Would it help you if I furnished you the original book and your original signature? A: I don't understand what you're saying. A: Was there an additional edition, a special copy that I signed? Q: That's what I'm asking. A: I don't remember. Maybe I did. Q: Okay. Can I furnish you a copy of the original book? Attorney Cox: You can show him. By Mr. Dubay: Is that okay? A: Oh, yes. I remember now. Q: --- is that your signature? Mr. Dubay: Would you like to review this? Attorney Cox: It's number 530 of 1,000. Thank you. I'll follow with this exhibit. You can hand that back to the reporter. Thank you. Next exhibit will be Warren Companion Page 126, Exhibit Number 15. Is it true that Marv Wolfman ascribes Stephen King as having sent in a number of scripts to Warren Publishing? Attorney Cox: Are you asking him if those words appear on the page? Mr. Dubay: I'm asking him if that is true that he stated that, and those comments exist in this document. A: I'm sorry. What was your question? By Mr. Dubay: The question is, is it true that Marv Wolfman describes Stephen King as having sent in a number of scripts to Warren Publishing? Attorney Cox: Objection. No proper foundation that this witness had knowledge. Mr. Dubay: This witness has acknowledged that he was a consultant on this book. By Mr. Dubay: Do you have knowledge of this interview? Q: You do? You have knowledge of this interview? Were you aware this interview was recorded by Jon B. Cooke? A: Was I aware that it was recorded? A: No, I wasn't aware that it was recorded or spoken without a recorder or not. I'm don't know how it was done. Q: Okay. But you were ---? Attorney Cox: You were not present? Could you read the answer back? By Mr. Dubay: Q: You were not present during the interview? Q: You were not present during this interview. Is that correct? A: I don't remember whether I was or not. Did Mr. Wolfman ever speak with you about Stephen King submitting scripts to Warren Publishing Company? A: I think he said when he was --- he was --- Marv was editor for about two weeks. I hired him and then two weeks later, Marvel hired him away from me. And during that period, I think he did say something about Stephen King submitting something. A: But I don't remember the details. Q: You had indicated that it was Marvel as the employee or the editor. A: I'm sorry. You're talking too fast for me. Q: Did you mean Marv Wolfman was an editor for two Weeks at Warren Publishing Company? A: I believe he was, yes. Q: Okay. So a short time? Okay. A: I think he was, yes. Did he say anything to you about what the disposition of those scripts were? What happened to them? A: If he did, I don't remember. Q: Do you recall who succeeded Marv Wolfman as editor of Creepy, Eerie, and Vampirella? Was that person Bill DuBay? A: Probably was, yes. It probably was, but I'm not sure. Q: Okay. If it were William DuBay, would he have received those scripts from Stephen King? Would they have been sent to him? A: No, this was done before and it wasn't done afterwards. 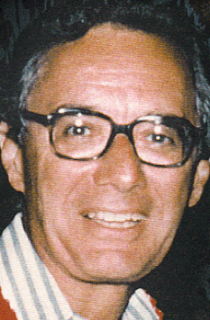 Marv Wolfman said that the scripts came in before Bill DuBay came there. Not afterwards. Q: Okay. But you were aware that he sent in the scripts. That's okay. I appreciate that. Thank you very much for your answer. Mr. Dubay: If I could hand that to the court reporter, please. Thank you. The next exhibit is Warren companion page 135, Exhibit Number 16. Do you recognize above Famous Monsters Magazine, there's a question. Q: I just wanted to point it to you so you could read it along. A: Well, I can read it first. A: When it says I gave Bill ownership rights ---. Q: Let me first establish foundation. Do you recall this interview? A: Yeah. I recall the interview, yes. Q: Okay. And then you recalled the question that Mr. Cooke asked you? A: I recall the interview, yes. Was the question in the later '70s and early '80s, did they produce The Rook and The Goblin, were you looking ---? A: Hold on. You're talking too fast for me. Was the question in the late '70s and early '80s, DuBay produced The Rook and The Goblin. Were you looking to get into the superhero market? A: The answer that is printed below that was my answer. enthusiastic about and have passion for, and publish it. I gave Bill ownership rights? A: But that's not the complete answer. The ownership rights I'm referring to is the fact that when I told him that if there was any subsidiary income from movies or television, he would get a piece of it. A: That was my definition of ownership rights. Q: Okay. But Bill did retain ownership rights, at least in part? A: He didn't retain anything because we never got any offers to retain. But when you say I gave Bill ownership rights, had there been any other offers, Bill would have received benefit of that? A: No. He would have received what I decided to give him had we received any big money from movies or television. Q: But he would have received a portion of that? He would have received some proceeds from that? Is that what you're saying? A: He would have received a portion of any movie or television rights that we might have gotten, had we had any offers. So you're agreement with Bill was that he would receive --- would have received a portion of any proceeds outside of publishing. Correct? A: Correct. To be decided by me. But there was nothing specific. Mr. Dubay: Can I have that entered into ---? The next document is Warren companion page 139, Exhibit 17. A: Yes, I read it. Is it true that Mr. DuBay answered the question what did you find particularly taxing? In part, he answered, no matter where the art came from though, from Hollywood to Barcelona, we had to make all the changes and corrections and paste in all the hand lettered balloons and captions in-house. That's labor intensive in itself, but I often create more work for myself by seeing a fresh or missed angle in a story during the final editing process. Would you consider that to be an accurate description by Bill? Attorney Cox: Objection. There were two questions. Attorney Cox: And one of them, there were no proper foundation. So I'd ask you to just ask one question and go from there. Mr. Dubay: Specifically lack of foundation because ---. By Mr. Dubay Mr. Warren, were you aware of this interview by between Jon and William? Q: You were not aware of it? Okay. Q: Do you recall what Mr. DuBay's responsibilities were at Warren Publishing Company as editor? A: He had a lot of responsibility. He had editorship responsibilities. He bought stories. He supervised production work. What else do you want to know? Q: Would he have to make changes to artwork? A: He would edit scripts sometimes. If you call editing rewriting, yes. There were times when he would change scripts. Q: Okay. Would you consider sometimes or at times that he heavily edited scripts? A: I wasn't there when it happened, so I couldn't say heavily or lightly. Mr. Dubay: Warren companion page 140, Exhibit 18. Attorney Cox: Unfortunately, it's not very legible on my copy. But perhaps the witness can read it. I just wanted to mention. By Mr. Dubay: Can you make that out? A: What are you asking me? Q: I'm curious if you can read this portion before I ask you a question that's relevant? A: I see his answer that starts with I think most knew. Is that what you're referring to? Q: Mr. DuBay describes that there were few scripts that got through intact. As a matter of fact, there was only one script or one writer whose scripts I pretty much leave alone, Jim Stenstrum. To your recollection, is that accurate? Q: To your recollection, was that accurate? A: I wasn't present. I have no idea. Q: Mr. Warren, when Marvel Comics entered the black and white comics magazine field, did you feel that Marvel was encroaching on your market? A: Depended upon what comics they were entering. I don't know which comics you're talking about. Q: Specifically the horror black and white magazine? A: Yes, I felt that way. Q: You felt that they were encroaching. Did you feel that Marvel was copying the look of Warren Publishing Company's magazines? A: I don't remember how I felt at the time. Q: Do you recall if you felt that they were copying the content of your magazines? A: I don't remember how I felt. I'd have to see what you're comparing them with. Q: Okay. Is this description by Mr. DuBay accurate when he writes, after that issue, Jim didn't want me to leave, so he kept my head on the masthead as consultant editor, giving him the option of calling me back to do special projects, movie magazines, one shots, and compilations? By Mr. Dubay: My question is, is it true that William DuBay --- that was the agreement between the two of you? A: I don't remember exactly what the agreement was. Q: Okay. But you did keep his name on the masthead as consulting editor? Attorney Cox: Objection. Vague as to time. Attorney Cox: Vague as to time. Mr. Dubay: Let's enter Warren companion page 148, Exhibit 19. By Mr. Dubay: Do you ever recall having a conversation with Mr. Bernie Wrightson concerning ownership rights for his work for Warren Publishing? Q: You don't recall the conversation. Is it possible that you were quoted correctly as saying, okay, I'm going to pay you the best money you ever made in comics? Attorney Cox: Objection. Calls for speculation. A: I don't remember if I said it or not. By Mr. Dubay: Did Mr. Bernie Wrightson have a work for hire understanding with you? Mr. Dubay: Specifically? Foundation objection? Attorney Cox: Foundation. It basically is asking about Mr. Bernie Wrightson's understanding. Mr. Dubay: I'm asking Mr. Warren if he had an agreement with Mr. Wrightson. Attorney Cox: That's a different question. You can ask that question. Did you have an agreement with Mr. Bernie Wrightson that expressed the arrangement as work for hire? Mr. Dubay: Warren companion page 252, Exhibit 20. Under appendix --- well, take time to review the document, specifically under Appendix B? By Mr. Dubay: Q: The question is, is it accurate that William DuBay wrote more stories than any other writer for Warren Publishing Company with a total of 262? A: I never kept a count, but it appears here that someone made a count of them. I can't vouch for this accuracy. But it does state on this document that Bill DuBay wrote 262 stories? Q: But does it state on this document that Bill DuBay wrote 262 stories, and that he was the most prolific writer for ---? A: I don't know if this is correct or not. Q: But does it state that in the document? A: It states that, yes. But I didn't write this. Mr. Dubay: I appreciate your patience. Exhibit 21 is the Eerie Volume 82 copyright registration. By Mr. Dubay: The name of the claimant. Did you have an opportunity to ---? Q: Have you had an opportunity to review it? Is the name of the claimant Warren Publishing Company? Mr. Dubay: Exhibit 22 is Eerie Volume 82 cover. Mr. Warren, do you recognize this as the cover? Q: Do you recognize this as the cover to Eerie 82, Eerie Volume 82? A: It's been a long time since I saw it, but I --- I can't --- I can't vouch for its accuracy because it's been too long ago. If you showed me the actual magazine, I could say yes, that's it. Mr. Dubay: Okay. Do you mind if I pull that out please? Attorney Cox: Not at all. That's good. By Attorney Cox: Okay. This appears to be an original Volume 82? Mr. Dubay: Would you like to look at it, Mr. Cox? Attorney Cox: I recognize it. By Mr. Dubay: But the answer to the question, was that a yes, this appears to be a cover of ---? A: Yes, it appears to be. Mr. Dubay: And there is the Eerie Volume 82 title page marked Exhibit 23. Q: Do you recognize this as the title page to Eerie 82? Would you like to see the original? Q: Okay. And it's consulting editor, Bill DuBay? Q: Okay. Cover art, is it attributed also to Bill DuBay? Q: Okay. I have a question if you don't mind? Is the cover art attributed to Bill DuBay? Q: And in the indicia, 1977 by Warren Publishing Company? And this, of course, is marked. Q: Thank you, Mr. Warren. Just trying to get through this as quickly as possible for you. Mr. Dubay: This is Eerie Volume 82, page 5, Exhibit Number 24. A: And what is the question? By Mr. Dubay: Q: Specifically, does it attribute the story script, the story as the author Bill DuBay? Mr. Dubay: That could have been a goof. Marked Exhibit Number 25 is Eerie Volume 83 cover. Mr. Warren, can you tell me if you recognize this as Eerie Volume 83, the cover? Mr. Dubay: Marked Exhibit 26 is the Eerie 83 title page. Do you recognize this as the title page for Eerie Volume 83? Q: Is it true that Budd DuBay --- excuse me. Is it true that Budd Lewis was the writer of The Day Before Tomorrow? A: I don't know if it's true or not. It says so here. I have to assume it is. Would you like to see an original? A: No. I see it's printed here. If it's correct, it's correct. And Bill DuBay is listed as consulting editor? Q: Are you doing okay? A: I'm fine. I'm cold, but I'm fine. Mr. Dubay: Exhibit Number 27 is the Eerie 83, Volume 83 preliminary cover. Do you recognize this as the Eerie Volume 83 Preliminary Cover? A: No, I don't recognize it because I can't remember whether this was the cover or not. This is a concept rough. Q: Right. If we refer to --- back to exhibit --- the prior exhibit? Q: If we refer back to the previous exhibit, which would be 26, this was the Eerie Volume 83 cover, if you would compare them? Attorney Cox: Twenty-six (26) was the title page. Mr. Dubay: Excuse me. Was it 25 that was the cover? Attorney Cox: Twenty-five (25) was the cover. Mr. Dubay: I apologize. Twenty-five (25). And if you can compare the two, does this appear to be an example of work that would have been provided to the final artist? A: We never did anything like this that I remember. Q: Would you like to see the original art so you can look at it? Q: Of course, I do. A: No, I believe you. It's just that I don't remember this, this number. A: Yes, but we don't know when that was done. A: It's not dated. It could have been done yesterday. Q: Oh, I understand. Is it marked on the bottom right-hand corner? Q: Did you review the document? A: I'm sorry. What's the question? Q: Is it marked on the bottom right-hand corner The Cartoon Factory? A: Yeah, it says The Cartoon Factory. Q: That was a company that was started and founded by William DuBay in 1976. I'll establish that further. I just wanted to answer your question, so you didn't think I was ---. A: What was the date? 1977? A: I don't recall anything that says The Cartoon Factory. We never had any Cartoon Factory in our company. Q: Right. That was a separate company then? A: There was never any company that I remember that said The Cartoon Factory in 1977.
exhibit, does it appear that that cover could have been been used as an example for this cover? A: Because The Cartoon Factory didn't exist at our company. And why would The Cartoon Factory be on this in 1977? By Mr. Dubay: Because William DuBay owned The Cartoon Factory. Mr. Dubay: Can I ask this question? Mr. Dubay: Well, he just asked me a question. I wanted to ---. A: I never heard of it. Fine, because I don't know about it. By Mr. Dubay: Q: Just --- we'll bring this back up at the time that's okay. A: If you're asking me did I see this or did this appear in 1977 at Warren Publishing office, the answer is I don't remember seeing it. Q: The question is could this have been used as an example or instance to the final cover rendering by the artist? Attorney Cox: Objection. Calls for speculation. There isn't a proper foundation. Mr. Dubay: Well, since he's the publisher, you'd be familiar with the process. Attorney Cox: There's no need to argue. Mr. Dubay: Oh, I understand. A: I don't think so. We didn't do things like this back then. By Mr. Dubay: When you say things, you mean, provide ---? A: I never saw a comprehensive thing like this before. We never did this. Q: Okay. This is the first time you've seen something like this? A: I don't think I remember ever seeing anything. Q: But it's possible that this was done? Whenever you say it's possible, I'm going to be objecting that it calls for speculation. Mr. Dubay: Okay. I can appreciate that. Exhibit 28, Warren Presents The Rook title page. By Mr. Dubay: Mr. Warren, it lists you as editor in chief and publisher. Q: Mr. Warren, what were your responsibilities as editor in chief and publisher? A: Just as it's stated. Q: Was it your responsibility to supervise all work? A: Not supervise. You'd have to define supervise to me. Was it your responsibility --- did you have authority and control over what was finally rendered in the final expression in the magazines? And does the cover art --- does it state Paul Gulacy on the title page? Q: Okay. Authors are Bill DuBay and Budd Lewis? Q: Okay. And the copyright claimant is Warren Publishing Company? Attorney Cox: A division of Warren Communications Corporation. Publishing Company, all rights reserved. Attorney Cox: I see. But then it defines Warren Publishing Company below. Mr. Dubay: I don't know that that was necessary. The question was simple. Is the copyright Warren Publishing Company? That was the question to Mr. Warren. Attorney Cox: The document speaks for itself. A: What was the question? By Mr. Dubay: Is the copyright indicia for this issue Warren Publishing Company? A: If that's what it says, yes. Did you have a work for hire arrangement with Paul Gulacy? Q: Paul Gulacy, the cover artist. Attorney Cox: Objection. Calls for ---. By Mr. Dubay: Did Paul Gulacy retain copyrights to any cover art that he would have submitted to Warren Publishing Company? A: No. We didn't have --- we didn't have copyright arrangements for people who did cover art for us. We own the cover art outright. Q: And you own the copyright to that cover art as well? A: We own the copyrights, yes. Q: Did that permission to make derivative works --- I mean, could you make changes? Did you have the authority to make changes to the work? Attorney Cox: Objection. Calls for a legal conclusion. Please go ahead and answer. By Mr. Dubay: Did you make or authorize changes to the original work that Paul Gulacy did? A: I don't remember Paul Gulacy. A: I don't know what he did, and I can't recall if we made changes or not. But anything that I published, we have the right to make any changes to if we bought --- if we purchased the work. Q: Very good. Would Mr. Gulacy have the right to publish the work in a career book collecting all of the artwork that he had presented? Attorney Cox: You can get an answer. Mr. Dubay: I understand. I'm just marking this exhibit. A: Do you want me to answer that question? Mr. Dubay: I'd like to enter Exhibit 29, the art. Attorney Cox: You're withdrawing the question. Correct? Mr. Dubay: I'm withdrawing it so I can restate it with evidence, if that's okay. Mr. Dubay: Okay. Exhibit 29 is the art book, Paul Gulacy. Does this appear to be a cover of the art of Paul Gulacy? Q: Would you like to see the original? A: No. I don't know who Paul Gulacy is. I don't recognize the name, and I don't recognize the art. Does this appear to be a cover of a book? That's just the question, not whether or not you recognize the person. A: I'm seeing this for the first time. A: This is what it appears to be. Q: It does appear to be that? Okay. Thank you. Mr. Dubay: Exhibit 30 is the Art of Paul Gulacy Book Page 92. Take a look at that. Do you recognize this painting? everything but the figures of The Rook and the robot were deleted. It's presented here in color for the first time. Would you recognize the revised version? A: I don't recognize any of this. Mr. Dubay: Exhibit 31. Exhibit 31 is Warren Presents The Rook cover. Do you recognize this as being Warren Presents The Rook, the cover for Warren Presents The Rook? Would you like to see the original? A: I don't. I don't recognize it, but I see it here in front of me. A: No. If it appeared, then it appeared. Yes. Q: Okay. So is the answer ---? A: But I recognize that it looks like one of our covers. Q: Is it the cover for the Warren Presents The Rook magazine? A: It looks like it, yes. Q: Okay. From the prior exhibit, do you notice the changes? And I'll hand it to you so you can compare the two. Do you notice that as an original or maybe the---? A: Do I notice what? Q: Is it possible --- excuse me. Is this a derivative, this exhibit, a derivative of this work? Q: That's a yes. Thank you. Mr. Dubay: Do you mind if I hand that back to the court reporter? Warren Presents The Rook Registration Number TX 204-709, Exhibit 32. A: Yes I see it. By Mr. Dubay: Do you recognize this as the registration TX 204-709 as Warren Presents The Rook? A: Well, I don't recognize it because I haven't seen it before. It's the first time I'm seeing it. A: I didn't make it a habit of looking at every registration thing that was put out. Q: That responsibility, as previously noted, was for Daniel Tunick. Correct? Q: And on the second page of this document, Mr. Tunick's signature appears? Q: On the second page of the document? A: Yes, I see it. What's the question? Q: Does Mr. Tunick's signature appear? A: That's his name, yes. A: And I recognize it as one of the things that he did with each issue, yes. Q: Thank you for volunteering that. The name of the author, it's listed as Warren Publishing Company? Underneath that, it asks the question was the author's contribution to the work a work for hire? And it is marked yes. Is that accurate? A: I assume it is. Q: Is it marked yes though? A: Yes, but I assume it's accurate. Q: And the author of, it says briefly describe the nature of the author's contribution. It appears it's a collective work. Is that correct? Q: Okay. Thank you, Mr. Warren. I do appreciate your patience. I'm trying to move through these as quickly as possible. You previously indicated ---. Excuse me. Exhibit Number 33 is Warren Presents The Rook Making of a Comic Book Hero. A: And what's the question? By Mr. Dubay: You previously testified that you were responsible for the editorial --- the final editing and the final expression of the magazines? A: I testified that I was responsible for the final editing of the magazine? A: When did I testify that? Q: Well, previously I asked the question if you're responsible for the final expression of the magazine? A: I don't remember that question. Q: Okay. Let me ask you this question. I'll state it now again? Q: As editor and chief for Warren Publishing Company, were you responsible for the final expression of Warren Publishing Company's magazines? Q: The Making of a Comic Book Hero? Q: You've never seen it before? A: If I did, I don't remember. to take time to read it, it identifies Budd Lewis and Bill DuBay as co-creators. It explains the process in which they created it, and also explains the contribution of one Howard Perez of Package and Play Development. A: Yes, but I can't read this. This is not clear. Attorney Cox: Why don't you show him the original? Mr. Dubay: If you don't mind. Here is the first page and the rear inside cover that would be a continuation of that. Attorney Cox: Take your time. By Mr. Dubay: Have you have an opportunity ---? A: I don't remember Howard Peretz. I don't remember reading this. But I was there when it was printed, all right. Q: You were there when it was printed? A: In 1979, I was running the company. Yes. A: I don't remember any of it. Q: Does that appear authentic? Q: Does that appear to be an authentic copy? A: Oh, yes, it appears to be. Q: Inside the article that you just read, does it describe Bill DuBay as starting The Cartoon Factory? A: It does, but I don't remember that either. Q: But it describes that in this book? A: Yeah, it describes it, but I don't remember it. Q: I understand. Does it describe Howard Peretz and his participation from Package Play Development? Q: Does it describe that Budd Lewis was Bill DuBay's partner in The Cartoon Factory? Q: Does it describe that The Rook character was created by The Cartoon Factory? And this would be the final paragraph on page two, if you'd like a reference. A: If it does, yes. Q: Does it describe Mr. --- The Rook being created by The Cartoon Factory? Q: Okay. Thank you. I apologize for the redundance here. I just wanted to get the answer on the record. Attorney Cox: It's a misrepresentation too. Attorney Cox: It's a misrepresentation. Mr. Dubay: Let's go back to what you're referring to. Attorney Cox: The words say and besides ---. A: And it also describes a couple things I'm not ---. Attorney Cox: And besides, a 30-page adventure featuring Warren's overnight sensation, exciting her heroes have been created. So it says besides that, exciting new heroes have been created at The Cartoon Factory. The Cartoon Factory wasn't founded until '77. Attorney Cox: Sure. The document says what it says. Attorney Cox: You can't change the content of the document. Mr. Dubay: I'm not trying to. All I'm asking here is does it say that, and then you're trying to provide some explanation. Attorney Cox: You don't need to. The document speaks for itself. Mr. Dubay: Oh, I understand. No, I'm just asking him if it says that because he read the document. I'm not trying to be argumentative. He says it says that. His answer is yes. You can't change his answer. Attorney Cox: I'll cross examine myself. By Mr. Dubay: Is it true that it says Warren's overnight sensation, exciting new heroes have been created at The Cartoon Factory by the same people who brought you Restin Dane and friends? Attorney Cox: Yeah, it's the same people. Mr. Dubay: I just wanted to make sure that ---. Attorney Cox: It distinguishes between Cartoon Factory. Let me just have a conversation with you. Attorney Cox: It distinguishes between The Cartoon Factory and the people who brought you Restin Dane and friends. Attorney Cox: And so you can't change what it says. Mr. Dubay: I never attempted to change it. I just asked if it said that and his answer was yes, Mr. Cox. Did I misquote it? Attorney Cox: Yes, you did. Mr. Dubay: Let me restate it and quote it correctly. Attorney Cox: And go through the entire sentence. Mr. Dubay: And besides a 30-page adventure featuring Warren's overnight sensation, exciting new heroes have been created at The Cartoon Factory by the same people who brought you Restin Dane and friends. Attorney Cox: So the people at The Cartoon Factory are the same people ---. then you became argumentative. And I'm just asking you not to become argumentative. I'm asking you to allow me to complete my examination. If it says it and he says yes, I'm not sure what the confusion is. You want to interpret it. Attorney Cox: No, you want him to interpret it, and you want him to misinterpret it. Mr. Dubay: No, no, no. I read it again as you requested from the very start of the sentence. Attorney Cox: Then let the witness answer based upon your --- but you're ---. Mr. Dubay: He did answer, and the answer is of record. Then it is of record that he didn't answer it based on what you said. A: I might add that not all of that is true. By Mr. Dubay: Is it true that this document states this? A: Is it true that what? Q: The reason why I'm asking if this document states this ---. A: I can't hear you. Q: The reason why I asked you if this document states this versus if you recall is because you indicated that you cannot recall certain things about this. A: No, I couldn't recall any of it. A: I don't recall any of it, but I know a lot of it is not true. A: A lot of it's hype. Q: But does it state this? I'm just asking you if it states this in a book that you were editor and chief of, does it state this? A: Well, it states it, but that doesn't mean it's true. Q: Okay. But you were editor and chief of this magazine. Correct? A: I could have been on vacation. It still doesn't mean it's true. Q: But were you editor and chief of this magazine? Mr. Dubay: This is the The Rook registration 303-625, Exhibit 34. Again, this is less legible than my copy. Is it permissible for me to take the sticker and put it on my copy because this appears to be less legible? Is that okay? Do you have a problem with that? This print, when it came out, appears to be less legible than the copies we have. Attorney Cox: Sure. Go right ahead. Yeah, that's fine. Yeah. Mr. Dubay: I appreciate that. By Attorney Cox: Exhibit 34 is The Rook Registration 303-625, Mr. Warren? And if you just confirm on the back page that Mr. Daniel Tunick signed this document? Q: Did Mr. Daniel Tunick sign this document? A: It appears to be that way, yes. The name of the author, is that Warren Publishing Company? Q: And underneath that, it says was this author's contribution to the work a work for hire, and it is marked yes. Is that correct? Mr. Dubay: The Rook Volume one, number one cover, Exhibit 35. Mr. Warren, can you look at that please? Does this appear to be a copy of Rook Number One, a Warren magazine? A: It appears to be. Mr. Dubay: Exhibit Number 36 is The Rook volume number one title page. Does this appear to be a copy of the title page for The Rook Number One dated October 1979? Q: Does it list W.B. DuBay as editor? Q: Is that William DuBay? Is W.B. DuBay William Dubay? A: Yes, I see it. It appears to be, yes. Q: And is the copyright indicia Warren Publishing Company? Q: Spelled out Warren Publishing Company. Is there any notice at all on this document whatsoever that it's a division of Warren Communications Corporation? A: I can't read this print. Q: Okay. Which are you having a hard time with? Attorney Cox: You know, I can stipulate that there is no reference to Warren Communications. Mr. Dubay: I appreciate that. Mr. Cox, you're a true gentleman. I'm coming to this letter dated September 27, 1976. Mark this as Exhibit 37. I understand that it has been introduced and I don't need to do it. Now, in 1976, what was, if you recall, Mr. William Dubay's nickname? Q: What was his nickname, his trade name? A: I called him Dube. Q: Dube. How is that spelled, if you don't mind? Is this letter addressed to Dube? A: I have to read this first. Q: Of course. I apologize. Q: Okay. Is it addressed to Dube, the nickname that you had given him? And on the top right corner where it's dated, it's dated September 27th, 1976. Mr. Dubay: No, no, no, no. Attorney Cox: He's already testified that those are a forgery. Was this letter dictated on that date? A: I didn't dictate this. Mr. Dubay: That was the question. It wasn't meant to be redundant, Mr. Cox. So the signature, you're saying, is not your original signature? A: I don't believe it is. Q: Okay. So you are aware the original document is available for examination? Mr. Dubay: It's not here. It's being sent via FedEx and I will produce that. But I have an expert that will authenticate the signatures on this document and another. I just wanted to state for the record. He indicated that it was not his signature, and I wanted to make sure that that's what he said. Attorney Cox: The witness said that? Mr. Dubay: The witness said that he did not believe signing it. By Attorney Cox: Is that correct? A: I didn't hear the question. Q: If I can refer back to this document? Attorney Cox: Exhibit Number 37. Was your answer that you did not believe you signed that or do you not recall signing it? A: My answer is I don't believe that that's my signature. Q: Okay. Follow-up question. Back to Exhibit Number 37. Are you absolutely 100 percent positive that that's not your signature? Mr. Dubay: Exhibit Number 38 is Garbo Editorial Rufus Number 49 Cover. Do you recognize this cover? A: I'm seeing it for the first time. Q: Okay. Did Warren Publishing Company or Jim Warren exercise his rights by licensing the word abroad in other countries, such as the Garbo Editorial? A: We did license our material to other countries, yes. Q: Is Garbo Editorial one of those? A: I don't remember if Garbo was one or not. Q: Okay. Can I produce the original magazine for you to take a look at? A: Well, I'd have to --- I would like to see the original. Mr. Dubay: If it's all right, I will also mark Garbo Editorial Rufus Number 49, Page 14 as Exhibit 39. A: --- as reproduction of one of our American editions, yes. Q: Were you Garbo Editorial or did you just license your work to Garbo Editorial? A: We licensed it to other countries. This appears to be one of our Spanish licensees. So Garbo Editorial is not Warren Publishing Company. Correct? Q: And the answer is yes, you do recognize this as the cover? A: Do I recognize what? Q: Do you recognize this as the cover? And if you don't mind, Exhibit 39 is page 14 of this book, if you'd like to take a look at the original. I'll also turn that to you. Specifically the title La Boca Del Inferno. If you notice, is the copyright Warren Publishing Company? Q: Is the copyright Warren Publishing Company? A: Where? Where are you pointing? Q: I apologize. And here's the original if you want to see it. Does that copy ---? A: DC Comix New York. I don't understand that. Q: So is that ---? A: What is the date on this? Q: This is a 1977. A: I don't understand that. DC Comix is one of our competitors. That's Superman. Q: Exactly. Well, let me ask you this then. Does --- since you only licensed certain works to Garbo Editorial, does it appear that Garbo Editorial also licensed work from your competitors? A: I don't know anything about Garbo Editorial, so I can't answer that. Q: Is that the DC Comix indicia? Does that copyright say DC Comix and not Warren Corporation? A: I know it says copyright DC Comix. A: It's possible that Garbo licensed from different companies and put them together in one magazine. Q: And it appears that's the case, and that's really what I was trying to affirm. A: That's what it appears to be. A: Some foreign companies did that. Q: Are you done with this? Thank you. Mr. Dubay: And if you can mark Exhibit Garbo Editorial Rufus Number 49, Page 39, Exhibit 40. By Mr. Dubay: In the bottom left corner, it has Guion, which is scriptor in Spanish. Is that the name Budd Lewis? Q: --- according to this document? A: It appears that he was, yes. Q: And over to the right, if you turn it to the side, it's probably easier to see it that way, what is the name of the indicia or the copyright? A: It's copyright Warren Publishing Company. Q: Warren Publishing Company. Does it say Warren Publishing Company, a division of Warren Communications Corporation? A: No, it says Warren Publishing Company. Q: Do you see Warren Communications Corporation anywhere on this? Q: Okay. Thank you, Mr. Warren. I appreciate all of your patience. I'm trying to move this. Mr. Dubay: Exhibit 41, Garbo Editorial Rufus Number 53 cover. If you don't mind taking a look at that. Do you recognize this as Rufus Cover Number 53? Q: Would you like to see the original? Would you like to see the original? Mr. Dubay: Exhibit Number 42, Garbo Editorial Rufus Number 53, Page 45. Do you recognize this as page 45 of Garbo Editorial? Q: It appears to be. And the indicia, the copyright indicia, can you read that to me please? Q: Can you read what it says please? Q: Can you read out loud what the indicia says? A: It says copyright by Warren Publishing Company. Q: Does that appear to be accurate? Q: Is that accurate? Is this a Warren Publishing Company title? Would you like to see the original to see if that's ---? A: It says Warren Publishing Company. Q: Okay. I'll accept that. Mr. Dubay: Exhibit Number 43, letter from Nicole Cuti to Budd Lewis. Do you recognize this stationery? Q: Do you recognize the stationery? Q: --- does that state Warren Publishing Company? Q: Does it state Warren Publishing Company? Yes? Q: I'm sorry. The question is do you recognize --- does it state Warren Publishing Company on the bottom of the stationery? A: What about it? Warren Publishing Company. Q: Does it state Warren Publishing Company? A: Yes, it states it. Yes. Q: Is there any mention of Warren Communications Corp.? A: It does not mention Warren Communications. Q: What is the date of this document? Does it show a date, a month, and a year? Q: Does that also mean July 1976? Attorney Cox: Objection. No foundation. By Mr. Dubay: Is this a letter from or does this appear to be a letter from Nicole Cuti? A: It's not a letter. It's a memo. A: And it's written by Nick whoever. Q: Nicole Cuti. Was he an editor for Warren Publishing Company? A: Nick was a contributor, but I don't remember if he was an editor or not. Q: Can I present to you Eerie 82? Q: Present to you my original copy of Eerie 82 that identifies him as an editor? A: Well, does it say he was an editor? Q: Well, if you can read? A: If it says he's an editor, then I guess he's an editor. Q: If you don't mind? Attorney Cox: At least he's an editor as of the date of that. Mr. Dubay: Precisely. Yes. Just establishing that Nicole Cuti was an assistant editor of Eerie. By Mr. Dubay: Do you recall the conversation? A: Assistant editor is not editor. It says assistant editor. Big difference. Q: Well, was he an editor? A: He was not an editor. He was an assistant editor. Q: Okay. I appreciate the clarification. A: Big difference. Very big difference. Q: I apologize. I didn't mean to confuse. Q: But he was an employee? Was he an employee of Warren Publishing Company at the time or assistant editor? A: I don't remember if he was an employee or whether he was freelance. I don't remember. Q: Okay. Do you recall this conversation? Q: You don't recall this quotation? Q: Okay. I appreciate that. Actually, going back to Exhibit 43, just one follow-up question. But is it true what he quotes here, whether you may be mistaken or not, we make comics and I own those comics at the time of July 1976? Q: Is it true that we make comics, meaning that you, Jim Warren, Warren Publishing Company makes comics and I own those comics? A: This is out of context. I don't know what context I said this. And I don't even know if I said it. If Nick says --- Nick's saying I said it doesn't mean I said it. Q: Oh, I can appreciate that. I was just curious if you owned the comics in 1976? A: I owned Warren Publishing Company. I owned Warren Communication Corporation. A: I owned the copyrights. I don't know how far you want me to take this. Q: I think that satisfies the answer. I think it does. I appreciate your clarification. Mr. Dubay: Near Mint Fanzine, Number 44. Mr. Dubay: Near Mint Fanzine is going to be ---. A: I didn't hear you. Mr. Dubay: Near Mint Fanzine. A: Yes, I'm not familiar with it. Attorney Cox: Is this document dated? Mr. Dubay: I can produce the original if you'd like. Attorney Cox: If you could, yeah. Mr. Dubay: It was dated in 1981, I believe, from what I recall of the time frame. Attorney Cox: Oh, yes. It says April 1981. Mr. Dubay: April 1981. Thank you very much. Attorney Cox: Your copy didn't have a date on it. include --- I mean, since you ---. Mr. Dubay: That the original. Attorney Cox: --- contains a date of April 1981. Mr. Dubay: Perfect. I agree with that. Thank you very much. By Mr. Dubay Q: The reason I bring this is because I just want to understand. Do you know --- do you recall what hours Bill worked? Q: What hours Bill worked, he typically worked? A: I have no way of knowing what hours Bill worked. I wasn't there with him at the time. Q: When you were present, do you recall? A: Well, I wasn't right by his elbow when he worked. A: But what is your question? Q: Well, the question was regarding his hours? A: I don't know what his hours were. Q: I understand. We'll move on to the next question if that's okay. Comic --- Bill is quoted in this interview as comic book writing is the lowest paid form of writing. The authors sign away all their rights to their work, and unlike any other writers, never realize royalties from their stories or characters they have created. In your understanding of your dealings at Warren Publishing Company, is that a true statement? And I can repeat it if you like. A: Well, it was true throughout the industry. A: That's the way the industry worked in those days. Q: I not only would agree, but that isn't what I asked. A: And what's your question? Q: Well, I mean, it's just that. Bill wrote comic book writing is the lowest paid form of writing. The authors sign away all rights to their work, and unlike any other writers, never realize royalties from their stories and characters ---? Q: Is he --- did he accurately describe the situation in 1981? A: He's expressing an opinion. Q: And is that opinion consistent with yours? A: And he's expressing an opinion when he says it's the lowest form, et cetera. I don't necessarily agree with that opinion. Q: But do you agree with his opinion that they sign away all of their rights, never realizing any royalties? A: Well, that's not an opinion. That was a fact and it was common throughout the industry. The answer is yes. Q: Thank you. That's all I was looking for. I apologize. A: There may have been exceptions, but the answer is yes. Q: Okay. Then it states the same is true for artists who spend a great deal more time per page than the writers. Was the same --- was it the same for artists also? Q: Okay. I appreciate that. And if you can flip to the back page. This is signed by Bill DuBay. Correct? Q: Is this signed by Bill DuBay? A: Is it signed by him? Q: Yes. Under where it says his name. A: Oh, his name? You're actually on authenticity? Q: Well, I have the original here as well, if you'd like to take a look at it. Attorney Cox: No. We don't do --- I don't think anyone could dispute that the typed name Bill DuBay appears. Mr. Dubay: That's all I was really asking. Attorney Cox: Well, that speaks for itself. Asking the witness to say what the typed words are doesn't make it any more true. Mr. Dubay: I can appreciate it. All I wanted to say is that this was Bill's interview. That this is something that he wrote. Attorney Cox: It purports to be Bill's interview. Mr. Dubay: It purports to be. That's what I was trying to get on the record. question-answer interview, but Bill's remarks were delivered in such continuity that we just eliminated the question. A: I don't think I understand. Attorney Cox: He's asking you to read English. He's asking you if those words appear on that page. Mr. Dubay: That's what I'm asking, yes. Attorney Cox: And that is not an appropriate deposition question. Mr. Dubay: Okay. So I guess you object. Is that what you're saying? Attorney Cox: I object. And I think it's --- to some extent, it can be used for harassment. Attorney Cox: I know you're not. And I just wanted to explain to you that in many cases, there are many documents. And to have a witness come in and tell you what the words are on the document is generally not an appropriate question because when it becomes repetitive, it becomes harassing. And I know you don't have a subjective intention to do that, and I don't want to say that. But I do want to say that you're not really advancing the ball by having the witness testify that the exhibit has these words on it. Attorney Cox: Okay. That's all I'm trying to do. I understand that you're not a lawyer and you're proceeding in a way that is much many systematic than most people who are representing this. Attorney Cox: So I recognize that, and I just wanted to say that I'm not being tricky when I say that. Mr. Dubay: Mr. Cox, I appreciate your comments. I do. Mr. Dubay: Trustee's bill of sale, Exhibit Number 45. Mr. Warren, do you recognize this document? A: No, I don't recognize it. Q: Would you like to take a moment and read over it? A: Okay. I read it. By Mr. Dubay: Does this document purport to transfer any rights to The Rook comic magazine? Q: Would you like to take an opportunity to review it? A: I don't know. I would have to talk to my lawyer and ask him that question. trustees bill of sale that identifies The Rook as a part of the sale? Q: Thank you. I have one more question before I ---. A: Excuse me. I take that back. The Rook was part of Warren Publishing material, so that does include The Rook. Q: Can you show me where it says that? A: Well, again, I'm not an attorney, so I can't interpret this. But if it takes into account all of the properties of Warren Publishing, The Rook is part of that. Q: It doesn't purport to. If we're reading it, it specifies. And I'm just asking if there's any specific reference to The Rook? A: I don't see the word Rook in here, but, again, I would have to ask an attorney that question. If you don't mind the final page, number two of the final page, is it true --- and this is here. A: I don't recollect this is the same document. throughout the world. Is that correct? Attorney Cox: Is that correct that it says that? Q: --- if he wasn't familiar with it and it's an official document used in the record, that it states that, if any. Attorney Cox: If he was familiar with it? Mr. Dubay: Exhibit 46, Warren Communication Corp Chapter 7 Bankruptcy Transcripts. Previously, you described a conversation between ---? By Mr. Dubay: Previously, you discussed a conversation with Bill whereby you requested certain documents from him. Do you recall? Q: Do you recall testifying earlier to a conversation that you had with Bill? Attorney Cox: You should say Bill DuBay. By Mr. Dubay: Bill DuBay. Excuse me. With William DuBay about certain documents that you requested from him? Q: Do you recall what those documents were? if you recognize this as the document that Bill ---? Q: Do you recognize this, the transcripts? A: Yes, but I don't believe this is what I requested. Q: You don't believe that this is the document? A: No. No, this is not what I requested. Q: But you do recognize this? A: Well, I --- I recognize --- I saw it when it first happened. A: But I haven't seen it since. But you recognize that you were there when it happened? A: I was there when it happened, yes. Q: Were you at the bankruptcy proceeding when it happened? Q: Were you at the bankruptcy proceeding? Q: Oh, okay. Because that's what I was referring to. That's when this testimony was taken. These transcripts are from that Chapter 7 bankruptcy. Q: --- to understand the extent. A: I probably saw this afterwards. Do these transcripts --- did this --- do these transcripts and did these transcripts provide you standing with your lawsuit in Warren v. Harris? Mr. Dubay: Okay. I can appreciate that. We'll have these entered at a different time, but I appreciate it. That's all that really matters. I don't want to have to go through them all because it would take some time. Attorney Cox: And just let's have a discussion about lunch. Are you --- how are you doing? THE WITNESS: I'm fine. I'm all right. Attorney Cox: Because I don't want the witness to get tired and hungry. Attorney Cox: Do you think we can finish before lunch or are we going to not? Mr. Dubay: I'm sure we can finish before lunch. Attorney Cox: Okay. So these are exhibits and you have like one or two questions for each of them? Attorney Cox: Let's then go ahead. Just be mindful of the witness's comfort. Mr. Dubay: I can appreciate that. Exhibit 47, Warren v. Harris Amended Complaint. Tell me if you recall that. Q: Okay. If you can look at paragraph four, is it true that you would ---? A: I'm sorry. What page? Q: Paragraph four. I apologize. It's on page three. Q: Page three. Page three, paragraph four? Publishing, the original owner of the Creative Works below. Q: Is that a true statement, the statement made of record? A: That I was the sole shareholder, yes. Q: Okay. You were the original sole shareholder and the original owner of the Creative Works? We're going to go to paragraph 22. And I will tell you what page that is. It's page nine, Mr. Warren. Can you flip to page nine? And it's paragraph 22. Q: Have you had an opportunity to read it? A: Is it true what? Q: Is it true that the sole shareholder and distributee of Publishing, upon its dissolution, was Mr. Warren? Creative Works, including the copyrights? Attorney Cox: --- to the best of your ability. By Mr. Dubay: Okay. Is it true that your position in your Amended Complaint is stated as such that the sole shareholder and distributee of Publishing upon its dissolution was Mr. Warren? Q: And that among property and assets distributed to Mr. Warren upon the dissolution of Publishing was the sole right, title, and interest in and to the Creative Works, including the copyrights issued in respect thereof? Attorney Cox: And I'll object that it calls for a legal conclusion. But subject to that objection, you can answer. Mr. Dubay: I'm just asking if he stated this for the record. Attorney Cox: It says --- the document says what it says. Attorney Cox: It doesn't become any more true by having the witness say that the piece of paper says this. Mr. Dubay: Then I will just rephrase it so it doesn't state the exact same thing. Mr. Warren, upon the dissolution of Publishing, did the copyrights revert to you in sole ownership? Go ahead and answer to the best of your ability. By Mr. Dubay: The question was is it true that the copyrights and all title, sole title, reverted to you upon dissolution of Warren Publishing? Mr. Dubay: Okay. He can answer. I just want to restate it. Did you ever assign or purport to assign any title or interest to the Creative Works or copyrights to Warren Communications? Q: Do you recall assigning? Q: You don't recall assigning any copyrights to Warren Communications Corp.? Mr. Dubay: Okay. Exhibit Number 48 is Warren v. Harris Order of Discontinuance. Take a look at that and let me know if you recognize the document. Q: This is specific here. This is why this question becomes relevant. Have you read it? Have you had an opportunity to read it, Mr. Warren? Do you recognize the document? A: I don't recognize any of these, but I understand what they are. It purports that there was a settlement of some sort that caused this order of discontinuance? Q: Did that take place on or about October 25th of 2000? A: I'm sorry. Did that what? Q: Did that settlement take place on or about October 25th of 2000? A: I don't know about the date, but the settlement took place, yes. Q: Certainly within 30 days of that date? A: It took place, yes. And what were the terms of that settlement? Let me restate it. A: I retained --- I got back the rights to all of my publications with the exception of that. Q: Did those publications include Creepy and Eerie? Q: And all works contained inside those works? Q: And all works contained inside those titles? A: All of the works, yes. The individual works inside? The individual works inside? That's all I have for this document. Mr. Dubay: Exhibit 49 is a copyright assignment unto New Comic Company. Take a look at this document, please. By Mr. Dubay: Do you recall this agreement? A: Do I recall the transaction? Q: Did you assign to New Comic Company your rights to Creepy and Eerie? Q: Did those --- did that assignment include all characters and all stories? Q: For Creepy and Eerie. Q: Would that also include The Rook? Q: The Rook was excluded from this transaction? A: The Rook as a publication --- as a separate publication, it was. Yes. It was a separate publication. By Mr. Dubay: Okay. Did you transfer all rights to all characters contained within Eerie? Q: Can you read the document? A: I don't remember what the transaction was. In the document it --- and I'll just read it out so you can refresh your recollection. Q: --- photographs, characters, dialogue, look and feel of the magazines? A: I guess so, yes. Q: Okay. Did you convey the characters contained within Eerie magazine to New Comic Company? A: If that's what the document called for, yes. Mr. Dubay: I wanted to avoid this document, but I probably can't now. This is going to be Exhibit Number 50. And it's assignment --- it's conflicting assignment of resolution agreement and quit claim deed. Have you had an opportunity to review the document? Have you had the opportunity to review the document? A: I have reviewed it, yes. Q: Can we start with the first page, the word agreement? On the third paragraph, it states the parties have previously had various disputes in connection with the IPs? A: You're going a little too fast for me. Q: Yes, sir. I'll slow down. Q: I apologize. I mean, start --- the third paragraph in order. And this ---? Q: Yes, sir, I am. Does it appear that this is an agreement that settles differences between ---? A: Parties have previously had various disputes. I don't understand that. 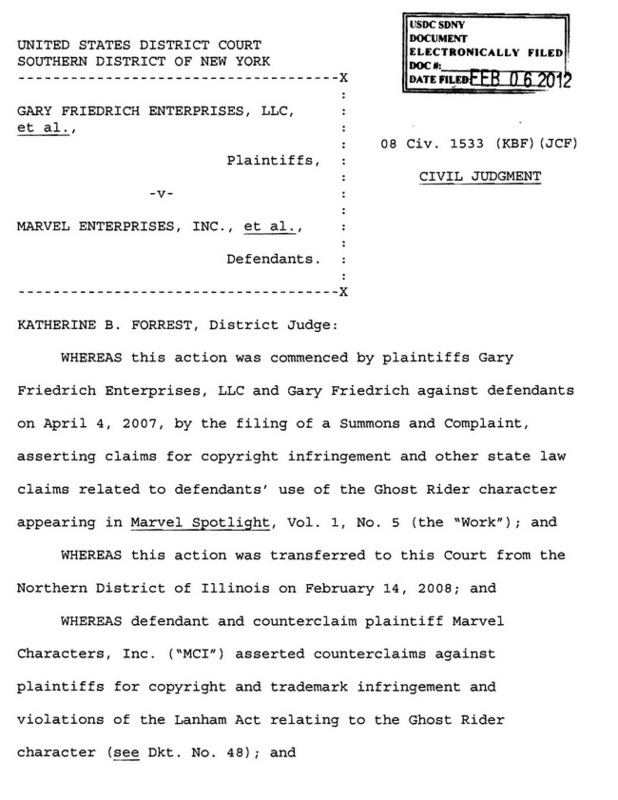 Q: Well, my question was does this appear to be an agreement between New Comic Company and William B. Dubay, LLC? A: It appears to be, but I'm not an attorney. Q: Oh, no. I understand. I wasn't asking for the meaning of it whatsoever. Just does it appear to be an agreement? A: It appears to be, but I'm seeing this for the first time. And I don't know what it represents. If we can turn to paragraph six? Attorney Cox: Paragraph numbered six? A: I don't understand. I'm not an attorney. I can't answer that. Q: Oh, I understand. Is the terminology quit claim deed in this ---? A: I repeat, I don't understand this. I'm not an attorney. Q: I can appreciate that. A: Well, what's your question? Q: My question specifically is the terminology and language of quit claim deed in this agreement. Q: Can you review page six? I'm not asking for the meaning of it as you interpret it. I'm just asking does it exist? A: I repeat to you, I don't know. This is legal words. Q: Are the words a quit claim deed? A: I don't even know what a quit claim deed means. Q: Oh, okay. I appreciate that. Attorney Cox: But the words are in there. We can stipulate to that. I mean, you did stipulate that a quit claim ---? Attorney Cox: That the words are there. Mr. Dubay: The quit claim is there. Perfect. As long as we stipulate that that's the case. Attorney Cox: Those words are there. Mr. Dubay: He was being very vague and trying not to answer that. I just wanted the answer. That's all. And I thought he should be privy to it considering he testified a moment ago that he assigned it to New Comic Company. So if they would have assigned it to me, he would be aware of it. Marvel Preview. Set it aside. We're going to go to Exhibit 57, the 1977 comic art convention. Attorney Cox: Exhibit 51 is next. Mr. Dubay: Oh, I'm sorry. It looked like 57 by the way she wrote it. Mr. Dubay: It's 51. Thank you for the clarification. Like I say, it looks like 57. Q: ---- comic art convention? Q: We create, others imitate. Who came up with that slogan? Q: We create, others imitate. Q: Where did that slogan come from? Q: Who were you referring to when you say others imitate? A: Other comic book publishers. Q: Can you specify who they were? I understand there were several. A: Marvel is one of them. A: They imitated us with their black and white comics. Mr. Warren, you're my hero. Thank you so much for saying that for the record. Well said. Mr. Dubay: Okay. This is Exhibit 52. And this is Creepy Volume 100, page 13, which is a survey that appeared in your magazine. Attorney Cox: Wasn't the original of this a two-page document? Mr. Dubay: No, it was not. It was a one-page document. Attorney Cox: Okay. Do you have the original handy? Mr. Dubay: I don't. I did not bring the original. I can send you the original. I have seven or eight copies of it with me this morning. I only brought Creepy with me. Mr. Dubay: But it will be self-authenticating. Attorney Cox: And what's the date of this document? Mr. Dubay: The year is 1978. The volume is 100. The page is 13. The date on the magazine is not printed here. Mr. Dubay: I can provide that to you for authentication. Attorney Cox: Okay. Fine. Fine. That's all. Mr. Dubay: As a matter of fact, I did produce that to you. If you look at the request for production, I provided that to you. Mr. Dubay: So you have this. Mr. Dubay: The original magazine you have, is what I'm saying. Mr. Dubay: And, of course, you have this as well. Attorney Cox: Okay. Thank you. Please proceed. By Mr. Dubay: Are you familiar with this? Have you seen this before? A: It's been 40 years ago. I'm not familiar with it to the degree I can discuss it intelligently. Q: Sure, sure. This is crystal on the top. Q: Did The Rook cause Eerie magazine ---? Q: Did The Rook or the introduction of The Rook cause Eerie magazine to outpace and outsell Famous Monsters of Filmland, Creepy magazine, and Vampirella? A: No. There's no way of anyone saying yes or no to that. Were the publication's figures --- when you published, inside the magazines, was there a federal statute that required the publication of the circulation figures in the magazines? Q: So is there a way to confirm the circulation numbers? Mr. Dubay: And this may have been something that I decided to set aside. If Mr. Warren can recall, then that helps. But if he can't, then let's get those circulation figures out. Attorney Cox: Why don't you authenticate it as Exhibit 53? Mr. Dubay: I got it. I apologize. Exhibit 53, The Rook, Creepy, Famous Monsters, Eerie and Vampirella 1982 Figures. If I can have this marked. Even though this is not the Eerie I was referring to, the survey supports what I was stating. But we can mark this. The statement of ownership, management, and circulation required by 39 USC. If you'd like, I'd like to produce an original, the original, so we can take a look to see if these figures appeared and, of course, they're accurate. It appears that the Creepy statement of ownership, and management, circulation is a little bit fuzzy. So it's hard to see that. But I will --- although I have produced the originals to you, I will also send you the original, a better scan. I don't know why that printed that way. Everything else is very legible. A: I'm sorry. Are you talking to me? Mr. Dubay: No, I'm sorry. I was referring to Mr. Cox, if he was looking for authentication of this. Here's the original. You can see how they appeared, Mr. Cox. Mr. Warren, can you confirm this to be an original Rook magazine? A: No, I can't confirm that. Q: You can take a look at it and tell me if you're familiar with it. Mr. Dubay: The Vampirella 104, you can see a little bit more fuzzy. But the only copy I had was the CGC copy. I'm going to crack it open and send that to you. But that's pulled from Comic --- from Vampirella Number, so you know. Do those appear to be correct? Attorney Cox: No. The witness can do the best he can with it. Mr. Dubay: I can produce the originals. I just wanted him to look at the original and make sure the circulation numbers because he said there was no way to tell whether the circulation statistics were published. I suppose there's a way to tell. A: I don't understand something. By Mr. Dubay: Q: Yes, sir. A: This says The Rook, Volume 13. Q: I apologize. That's the volume number? That's the circulation first appears. A: No. It says number 13. Q: It says number 13 right here. I apologize. It's spelled out 13? A: It looks like something's wrong. That means this is the 13th issue of Rook? Q: That is the 13th issue of The Rook. A: Do you have the 12th? Q: Do I have the 12th? Q: I have every single issue. A: You have all the issues? How many issues did Rook go? Q: There's 14, unless you include Warren Presents The Rook. I know that was a one shot. But aside from that, there was ---? A: How many issues did it go? Fourteen (14)? A: Do you have the 14th issue with you? Q: Do I have --- no, I do not because that's the last issue. And I'll explain and I'm sure you know this. Not every Rook had the circulation statistics. They were only published in the months of February and March for the year. And then you'll see that all quarterly numbers are included in there. So it gives the average of the quarterlies. A: Why do I think it was discontinued after four issues? And I wasn't asking about it being discontinued. I understand that it states that --? A: Did it come out? How often did it come out? Q: Six times in 1982. A: Six times a year? Q: Not every year, but since times in 1982. Q: 1979 would have been the first one. That was two issues. 1980, I believe that was five. And I believe --- I can't say for certain. A: That would be 13 issues. Thirteen (13). Q: I can't say for certain how many were in 1981. I can just tell you we have a circulation. A: Well, when was the first issue? Q: October of 1979. I believe it was October of 1979. A: Well, if issue number one was October of '79 and 19 --- that means it was published in '80, '81, and '82. Q: I don't disagree with that. Attorney Cox: There is something --- Exhibit E, just again, this states that the issue's published during the year were nine? Mr. Dubay: That's not --- that's Vampirella. Attorney Cox: So this is --- Exhibit E is only Vampirella? Mr. Dubay: That's only Vampirella. And the reason I produced that a moment ago, I pulled it from Comic Con because otherwise, that issue is a CGC issue, which means it's a sealed document under seal. I can unseal it. I'll open it and share it with you. But that would give you the full picture. But since Comic Con published the statistics, I provided that to you. A: Excuse me. 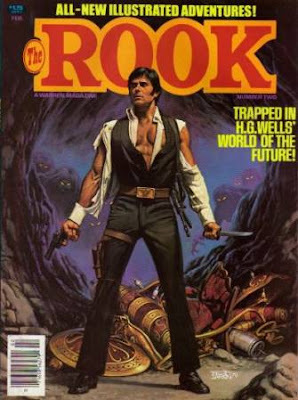 You said the first issue of The Rook came out in '79? By Mr. Dubay: I believe it was October of '79. Is that correct? A: And in 1980, how many issues? Q: I don't recall the number of issues in 1980. I can say that in 1982, I believe it was six issues? A: No. In 1982, how many issues? Q: I believe it was six issues in 1982. I believe. You can't quote me on that. I'm just being as honest as I possibly can. I think the scope of the question, I just want to restate it. A: Even though that says number 13, I don't --- I can't see how that could be. Q: This is self-authenticating. I can produce 100 copies of everything that I have. I mean, I can have several people authenticate it. Attorney Cox: The witness only knows what the witness knows. Mr. Dubay: I know. I think what he's doing is he's --- my question was only this, Mr. Cox. I'm sure you can appreciate that. Were the statements of ownership, management, and circulation number's published inside the magazines? Q: They were published. And you compared these. Is this accurate? A: I can't tell you that. Q: What's reported in here, is that reflected in there? A: That doesn't mean it's correct. Q: But it is stated in this magazine? Q: Okay. Well, according to the information available to us, is it apparent that The Rook outsold ---? A: I question these figures. Q: Is it because you question the authenticity of this magazine? A: I question that it was 13 issues, and I question the figures. I don't think they're accurate. Q: Do you dispute that this is issue 13? A: I don't see how it could be 13 because I don't ---. A: In 1979, there was one issue. In 1980, '81, how many issues were there? You say there were six in '82. By Mr. Dubay: You're specifically asking me to ---? A: How could there be six issues in '82? Q: I'm not --- oh, you know what? It's probably six? A: We went bankrupt in May of '82. How could there be six issues? Q: Well, then you know what I more than likely was referring to was that there were six issues that would have been identified in those statistic numbers because ---. A: --- in May of '82. How could there be six issues? this along. Do you dispute that this is an authentic? A: I dispute that that's issue 13. There weren't 13 issues. Q: You dispute the authenticity of this magazine. Correct? A: You're not listening to me. I dispute the fact that it says number 13 on the cover. And I don't think it went 13 issues. Q: Would you like to look at this please? A: No. I mean, the fact that it's printed 13 doesn't mean that it's correct. Follow me. 1979, there was one issue. Q: I understand. I understand how adamant that you're saying that there's not 14 issues. A: No, I'm not saying that. I'm saying it doesn't make sense to me. If someone will explain to me how that got to be 13, because I can't see how there were 13 issues if the first issue came out in October of '79. A: And then you add '80 and '81. Q: '82, this is dated February of '82. And I know for certain that there were 14 issues. A: It doesn't matter what's printed on the cover because that could be inaccurate. Q: Okay. I'll produce all 14 issues for the Court. A: In other words, if you can produce 13 issues, then I'll --- on the table, then I'll ---. Mr. Dubay: Mr. Cox, do you believe the statement of production as it relates to these issues? Attorney Cox: I haven't gone through all the documents that have been produced yet. I went through and looked for things that were textual in nature. Mr. Dubay: I understand. Let's lay that aside. Attorney Cox: Yeah. I mean, why don't we just get the witness' beset understanding and go on. I mean, ---. Mr. Dubay: Well, I was only trying to narrow the scope to one thing. Are the circulation statistics published in the back of the magazines? A: No, they're not accurate. Q: I'm not asking if they're accurate. A: Even though they're sworn to, they're not accurate. Q: I understand. I'm just asking if the statistics are published in the back of the magazines? Q: Thank you. Thank you. A: But that doesn't mean they're correct. Q: Who is responsible for the ---? A: Daniel Tunick. He's dead. Q: It has the publisher here, James Warren? A: --- for the ---. Q: So are you suggesting that Mr. Tunick reported these numbers? A: I'm suggesting that maybe Mr. Tunick made an error. Q: Oh, I wasn't getting that. A: We can't disprove that or prove it because he's not alive. He's been known --- he's been known to do that. Q: The only thing we do know though is that the statement numbers are printed in the back? A: I'm saying the statement may not be correct. A: I've known the publisher long enough to know that. A: I know why they ---. Q: I'll defer to your experience. A: Publishers inflate them because if they don't reach a certain amount, they don't get a second class permit, mailing permit, which means it'll cost them 25 times more to mail their magazines. And so they lie. It's called lying. Publishers have been known to do that. A: Oh, do they ever. A: I didn't say I did. I said publishers do. A: Some of them do. Q: And you're saying the information printed in your magazine ---? A: I'm not saying that that's a lie. I'm saying it's possible. But I'm also questioning the number 13. I'm not say 13 is inaccurate. A: I'm only saying ---. Q: Chronologically, it should be more? A: If you have 13 issues physically, then I believe you that I'm wrong. A: But have you 13? Q: There's 14 issues. There's one issue that actually ---. Q: There's one issue that follows this, and it's volume 14, and that was the final issue for The Rook? Q: The final issue for The Rook magazine is volume 14? A: I know, but I don't see how 14 were published. Q: Okay. I can actually ---? A: But you have 14 separate issues at home? Q: Yes, sir, I do. A: Okay. If you say so. Q: Several copies of each one. Q: I'll be happy to send you a set. A: No, if you say so. Q: But the only question that was relevant, and I apologize for straying, I'm not trying to, is that the statement --- the statistics that are published in the back of the magazines support --- if they were greater than the other magazines at the time in one publishing catalog? Attorney Cox: I'll be objecting on the grounds that that's an argumentative question. A: I would question these figures. Q: Okay. But we just ---? A: Even though they were published. Q: Okay. The statistics were published in the back of the magazines? A: I would question them. By the way, these, those numbers, are just for that particular issue. Q: If you read the circulation, it states that it was the average of the prior year. A: Average of how many? Q: Doesn't state how many. Maybe it does, but it says August, June, August, October. You may be right. Six times a year. That's exactly what it says. The frequency of issues, six times per year, February, April, June, August, October, and December. And if you'd like, you can read that. A: --- or a compilation. Q: --- that's this says. It's an average. Average. You can read it right there. Q: But they are published? A: --- that's neither here nor there. I question it. I doubt it. I don't believe it. Q: You don't believe that they're accurate or you don't believe that they're published? A: I just don't believe it. Q: Can you specify ---? Attorney Cox: He stated that they were published. Attorney Cox: He doesn't believe that they're accurate. A: That doesn't mean that I'm right. By Mr. Dubay: I understand. A: It just means I don't believe it. Q: I understand. I mean, I wouldn't believe it either. A: I been around publishing too long to know better. A: Okay. So where are we? Q: As long as we agree that they're published is all that matters. Q: And in this document here, the question was simply, according to this ---? Attorney Cox: Exhibit? When you say this document here, give an exhibit number. Mr. Dubay: Yes, sir. You're right. Exhibit 52, the Creepy Volume 100 Page 13 Survey. Does this reflect that Eerie magazine outsold Vampirella and Creepy magazine? Q: It provides the statistics. A: I know. I see them. I see them. But that doesn't mean I agree with the figures. Q: But does it state that? Q: Does it state that Eerie magazine ---? A: It's whatever it says it says. But that doesn't mean it's correct. A: Even though I'm editor in chief, that doesn't meant it's correct. Q: I can appreciate that. The fact that it states it in your front, that's what ---? A: Yeah, that's what it states. Q: That's what it states. Thank you. Thank you. A: And also, we have a disclaimer underneath that. A: We don't necessarily agree with those figures. Attorney Cox: Are those ---? Mr. Dubay: I don't know that that's what it says. It says opinions. These aren't opinions. Attorney Cox: They may not reflect the thinking of Warren Publishing Company and our employees. Exactly opinions. Mr. Dubay: Yeah, but this is --- it's stating opinions. It says before that his opinions. Attorney Cox: It's probably close to being right. Mr. Dubay: --- I can appreciate that Mr. Warren doesn't like what the numbers reflect, but that's what they do reflect. By Mr. Dubay: And I appreciate your honesty. And we are just about done. I know I hear a sigh in here under every one of your breaths. Q: --- were you aware that Stephen King read the material of Warren Publishing? Mr. Dubay: I was going to ask how he became aware of that. Attorney Cox: Objection. Vague and ambiguous as to time. Vague and ambiguous as to material. Mr. Dubay: Okay. All right. I can appreciate that. Exhibit Number 54, Secret Windows cover. Does this appear to be the cover of a Secret Windows book? A: I've never seen this, so I really can't give an opinion on this. Q: I'll just take the dust cover off. You don't have --- you've never seen this? A: No, I'm not familiar with this book. Q: Okay. I can appreciate that. Secret Windows Page 11, Exhibit 55. I guess this goes back to I have to lay a foundation. Is the title of this essay The Horror Market Writer and the Ten Bears a True Story? Q: Is the title of this essay The Horror Market Writer and the Ten Bears? Q: And it's noted underneath it, A True Story? Mr. Dubay: Exhibit Number 56. Page 20. And this goes to the question are you familiar or were you familiar with that Stephen King read Creepy, Eerie and Vampirella? Mr. Dubay: Under what basis? This is providing him the knowledge. Attorney Cox: That's not stated in --- that's not stated in this exhibit. Mr. Dubay: It states in a recent issue of Creepy a college student took a writer severely to task for putting a witch-burning into the story of Salem witchcraft hysteria in the 1660s. No Salem witch was burned, the reader quite rightfully pointed out. He would have had to have read it to be able to state that. Mr. Dubay: No, I'm not trying to argue it. But I can appreciate your point. No problem. No problem at all. Exhibit Number 57, Secret Windows Page 21. Does Mr. King note that the magazines published by Warren Publishing Company include Creepy, Eerie and Vampirella? Attorney Cox: And you're asking him to assume that Mr. King assembled that? Mr. Dubay: I can provide --- I can provide this to authenticate it. Here is the title page to confirm the author as Stephen King. By Mr. Dubay: Q: Does it identify Warren Publishing Magazines published as Creepy and Vampirella? A: It looks like it does. Q: Thank you. I appreciate that every much. A: I haven't read that. I don't know. Q: It says it here. As a matter of fact, if you read a few of his ---. A: I don't read Stephen King too often. Q: I don't doubt that. I don't doubt that. Secret Windows page 22, Exhibit Number 58. Who does Mr. King believe, at the time of this article in 1974 --- let's do this. Attorney Cox: Objection. No proper foundation. Mr. Dubay: Okay. All right. Are Stephen King's opinions expressed in this writing as to which publications contained the best material? Q: Yes, it is. Are Stephen King's opinions expressed in this publication as to which publications contain the best ---? A: If he wrote this. I mean, this is --- this is not written by Stephen King. It's written by someone from Writer Digest. A: Yeah, but it could have been a ghost writer. Q: You are --- you're funny. But my question was are Stephen King's opinions, even if it was by a ghost writer, expressing that Warren Publications are the best material in the market at the time of this? A: Well, if you were to interpret it that way, you'd have to ask Mr. King that. Q: I'm asking if he expresses an opinion that Warren Publications are the most open to freelance inquiries and contributions, that they were the first in the field, and they still publish the best material. Q: A very clear word. A: Are you asking if I agree with him. Q: No. Did Mr. King express his opinions that Warren Publications were the best material in the market at the time that this was written? Q: Did you need to review the document? A: I did read it. Q: Can I provide you the original document? A: No, I read all of it, but the answer you have to ask Mr. King that. Q: I'm just asking if he expressed it in what you're reading? A: It appears that he did. Q: Okay. Is that a yes? A: No, that's a maybe. Q: Okay. Does he express that the second choice for good horror material is Marvel Comics? Q: Can you open that and take a look? A: Sure. That's an opinion. Q: Thank you. That's what we're trying to get at. Is it also his opinion then that Warren Publications are the most open to freelance inquiries? Attorney Cox: Objection. Argumentative. No proper foundation. By Mr. Dubay: Is his opinion expressed that Warren Publications are the most open to freelance? By Mr. Dubay: Does Mr. King identify what the best material in the market is at the time? Q: In the writing, does he? Q: And what might those be? A: He may not have had all the sources at his disposal. Q: I can appreciate that, but my question is whether he expressed that. And your answer is maybe? Q: Probably. It appears so? Q: Okay. It appears so. That's an affirmative answer. All right. Mr. Dubay: Exhibit 59, Danse Macabre cover. Does this appear to be a book written by Stephen King? Q: Does this appear to be a book written by Stephen King? Attorney Cox: The cover of a book? By Mr. Dubay: The cover of a book? Q: Okay. Does it appear to state on the cover what makes readers and moviegoers so hungry for good scares, Stephen King's essential overview of the horror genre? Is that that what is stated? Would you like to take a look at the original? Q: Would you like to take a look at original? A: Would I like to? Q: Take a look at the original Danse Macabre cover page? Q: The reason I ask is ---. Mr. Dubay: Exhibit Number 60 is Danse Macabre title page. The question is very limited. The copyright indicia, is it marked 1981 by Stephen King? And if you'd like, I can show you the original. A: It looks like it. Mr. Dubay: Would you like to see the original, Mr. Cox? Attorney Cox: I've seen the original. Mr. Dubay: Danse Macabre Page 369, Exhibit 61. A: What the was question? By Mr. Dubay: Does Mr. King reference a survey published in Creepy magazine? A: Did he write this? Q: I just provided to you the copyright of the book. That's shown in the indicia. Attorney Cox: I'll stipulate that Danse Macabre was a Stephen King book. By Mr. Dubay: And then the question was ---? Q: You just reviewed the survey. A: --- you keep referring to. Q: We just reviewed the survey. A: It could be a different page. Q: Oh, okay. Okay. Well, my question was only if he --- does Mr. King identify a survey, a 1978 survey, published in Creepy magazine? That was all. Mr. Dubay: I think we're done. Can we take a break for just one moment? Mr. Dubay: It appears that my Cross Examination is done, but I reserve the right to reexamine the witness should the need arise. Attorney Cox: Well, the extent to which you do or don't have the right to reexamine the witness is a matter of law. Attorney Cox: So I have no further questions of the witness. Wonder why the defense didn't move for summary judgment on Warren's claim. Is it that their expert witness, Richard Orsini, said Warren lied about the forgery? Wait a minute. Warren perjured himself? But why? Has anything interesting happened lately? Maybe.